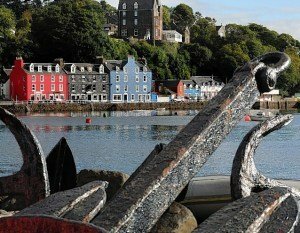 Only 35 minutes on the ferry from Kilchoan and you’ll sail into the small fishing town of Tobermory, instantly recognisable for its beautiful row of many-coloured houses huddled around the bustling harbour. Walk off the ferry straight onto the main street, where you’ll discover lots to see and do before sailing home. If you feel like perusing some art and enjoying an elevated view, take your first left after the ferry (after the corner shop) and walk uphill for ten minutes to reach An Tobar, (‘The Well’ in Gaelic) a beautiful old school building which has been converted into a cultural arts centre, with a great programme of events, an art gallery and a café serving light lunches, home baking and coffees. From the ferry, stroll along the high street and peruse the many cafes and shops which have a range of local produce, arts, crafts and gifts. You may not have seen an ATM for a while by this point so you can pay a visit at the bank if needs be. Under the clock tower, watch the fishermen haul in their day’s catch straight to the fish and chip van, serving award winning fish and chips at lightening speed. Grab an ice cream from Kyle’s ice cream shop and watch the boats sail in and out. Check out the latest sea life sightings at the Whale and Dolphin centre, which also has a small, interactive exhibition and gift shop. Behind the CO-OP you’ll find An Camus arts and crafts centre, which runs art classes for children and adults. Further down the main street you’ll find the Tobermory chocolate factory, which has a wonderful array of exquisite chocolate, handcrafted onsite. It also has a little café serving coffees and cakes. At the end of the main street you’ll find Ledaig car park. Here you can enjoy a tour and some whiskey tasting at the distillery of the distinguished and world-renowned Tobermory whiskey. Further along is the Tobermory Aquarium, Europe’s first catch and release aquarium, which has an interesting array of creatures from local Scottish seas. With fun talks for kids, feeding time, and an interactive and informative display about Scottish seas, it’s great fun for all the family. If you’re hungry by this point there are many great places for lunch. If you’re after a home-cooked, reasonably priced pub lunch the Arms is a favourite local spot, or if it’s sunny grab a table in the beer garden at Macgochans in Ledaig car park. 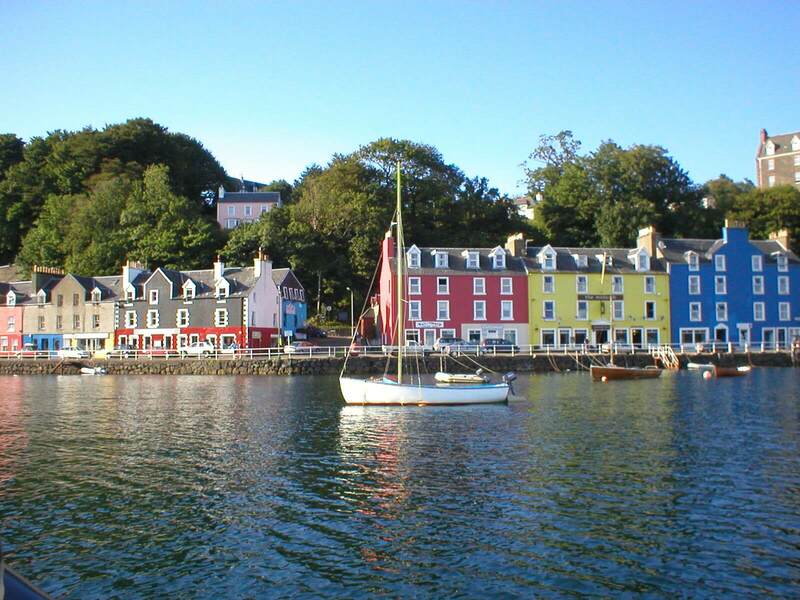 There’s plenty spots for a light lunch including the Bakery, the Tobermory Scullery and the Pier Cafe. We would highly recommend the Café Fish which has a delicious menu of fresh, local seafood and is housed in the white building next to your ferry. Make sure you keep an eye on the clock tower so as not to miss your ferry home! If you’ve still got half an hour why not stop for a dram, just before the ferry, at the famous Mish Nish Hotel, unmissable for it’s bright yellow front. After the bustle of Tobermory high street you may be happy to be heading home to the unhurried peace of Kilchoan. Keep an eye out for dolphins and otters on your sail home.